The U.S. Environmental Protection Agency (EPA) under a federal law called the Resource Conservation and Recovery Act (RCRA) regulates the packaging and transportation of certain wastes on public roads, highways, rails, and waterways. Under RCRA, certain procedures must be followed when generating, storing, transporting, treating, or disposing of hazardous waste. This includes waste generated by remediation projects at FUSRAP, Superfund, Brownfields, and RCRA sites as well as at other commercial locations. Hazardous wastes such as low-level radioactive soils, asbestos-laden materials, sludges and other contaminated soils require packaging that provides containment as well as protection during transportation to the transfer facility or destination landfill. If the area is served by rail, the material can be transported by rail gondola car. Other options for shipping contaminated materials are by barge, dump truck/ trailer, and roll-off container. Waste packaging products are designed to comply with regulations and keep containers clean. IWT’s Cargo-Guard division contract manufactures quality railcar liners as well as custom dump truck, dump trailer and roll-off container liners for safe, reliable transport of contaminated materials. We design our form fitted Black Stallion® railcar gondola liners for easy installation while ensuring a secure, sift-proof package to the destination landfill. Please contact us at 609-971-8810 so we can help you design a cost-effective, dependable containment solution for your waste transportation needs. Portable spill containment products include absorbent pads, booms, socks, storage drums and spill kits. Secondary containment products include berms, overpacks, trays, mini basins, and more. A secondary containment system surrounds the primary system in the event of a hazardous material spillage or container failure. Hazardous materials include, but are not limited to chemicals, hazardous waste and oil-filled equipment. The system must comply with the regulations set forth by the EPA’s Spill Prevention, Control, and Countermeasure (SPCC) rule 40cfr112. Below is a summary of the main points. A secondary containment system must be impervious and free of cracks or gaps. It must also have sufficient capacity to contain the spill. Any waste that has spilled or leaked into the secondary containment area must be removed in a timely manner to prevent overflow. The system must be either sloped or specifically designed to quickly and easily remove spilled or leaking liquid. Precipitation must be prevented from entering the secondary containment system unless the system has sufficient capacity to contain additional volume. Certain types of facilities such as refineries, airports and landfills are required to have secondary containment plans in place to contain fuel, oils, sludges and other chemicals. Specialty geomembrane liners provide a sound solution by preventing pollutants from spilling or leaking into the soil and groundwater. These liners can be fabricated and installed to create large containment areas for underground tanks, above ground tanks as well as portable chemical storage containers. When selecting a geomembrane liner it is important to choose a material durable enough to provide long term containment against UV exposure, extreme weather elements, as well as thermal expansion and contraction. It must be strong and thick enough to resist punctures and tears as well as the pressure of the primary storage container. Most importantly, the liner must not react or deteriorate after long-term contact with the toxic, flammable, combustible or corrosive fuels or chemicals it is holding. Environmental remediation sites can contain a wide array of contaminants in different levels of concentration. When cleaning up these sites, there is often a need for offsite disposal of the contaminated soils/materials. Dump trucks, dump trailers, railcars, roll off trucks, and barges are different methods for transporting contaminated product. Often the waste containers must be lined with a temporary polyethylene liner for protection. States’ requirements vary as to what is considered a contaminated material and how it should be transported. 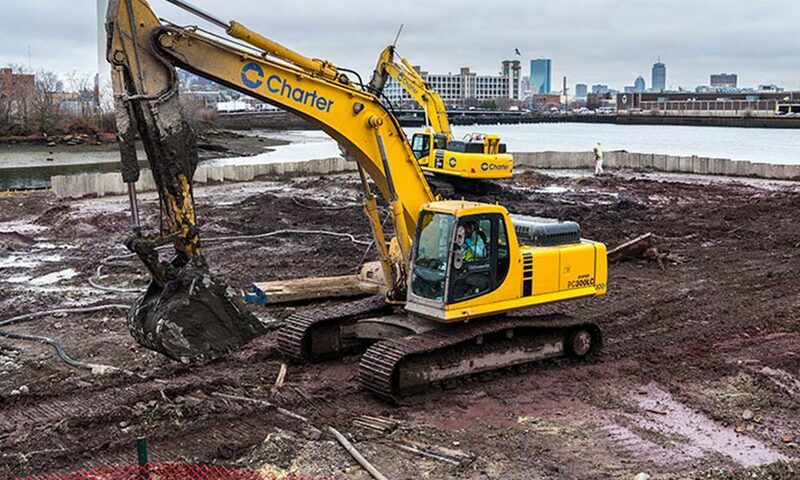 This was the case with a project IWT Cargo-Guard supplied in Everett, MA for Charter Environmental called the Wynn-Everett Resort Remediation Project Phase 1. The land along the Mystic River waterfront in Everett, Massachusetts had been contaminated from industrialization since the 1800’s. Wynn Resorts bought the land to develop a luxury resort and casino. However, before the project could move forward the 22-acre site needed to undergo an intensive remediation process to remove a host of contaminants such as TSCA/RCRA regulated soils, arsenic and lead. Much of the site was able to be treated in situ but some of the “hot spots” required off-site treatment. As a result, the material needed to be transported safely in waste containment units. IWT Cargo-Guard was called upon to supply custom 20 mil Polyethylene Tri-Axle Dump Truck Liners to line the trucks hauling the contaminated soils. 10 mil liner is the heaviest that manufacturers prefabricate, so we needed to tap into our fabricators to create this custom 20 mil LLDPE design to cut down load time. It worked out well and Charter was able to haul the material successfully and safely without issue. Most of the soil was transported to Turnkey Landfill in New Hampshire over the course of 4 months, with 12 trips a day. The utmost attention was given to truck routes as to not disturb the local communities they traveled through. No leakage was detected thanks to the 20 mil thick liner providing the proper containment Charter needed. Please contact us at 609-971-8810 with your waste packaging needs, we’d be glad to assist. Let us provide you a solution that will work for your budget and time constraints.